Caprese Sandwich – Jay Luker – Really? ... Wow. Tomato from the garden, mozzarella from Fiore Di Nonno, whole wheat baguette from Hi-Rise. Slathered with homemade pesto. Bread could have been better. 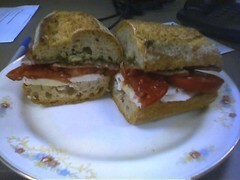 It was fresh from yesterday, but I think it stiffened up while the sandwich was in the fridge this morning. That plus it being such a huge sandwich made it tough to eat. Confession: I originally had some slices of salami on here too (picutred), but it just wasn’t working and I eventually took them off and ate separately.